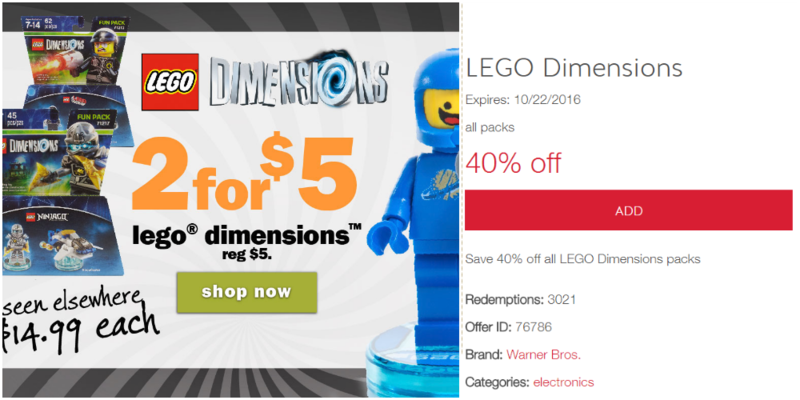 Two great LEGO Dimensions sales this week to pass along to you to save big on some packs. The sales are available at Five Below and Target stores. Five Below is offering their supply of Fun Packs on sale for 2 for $5. Typically Five Below’s selection of packs are regularly priced at $5, which is still a great deal. The deal is valid online, unfortunately no way to get a discount on shipping that I’ve seen. The in-store selection matches up essentially the same with the online selection. So if you need any of these packs, getting them for $2.50 a piece isn’t a bad deal! You can take advantage of this deal in-store and online through Friday, October 21st. Target is offering a Cartwheel coupon to discount ALL of their LEGO Dimensions Packs by 40%. This includes Fun, Level, Team, and even Starter Packs. Starter Packs are currently marked at $79.99/$89.99 in-stores. Remember, cartwheel coupons can only be applied to four qualifying items per transactions. But your cartwheel discount can be used in 6 transactions each day. So if you are purchasing more than 4 packs, be sure to make multiple transactions. You can take advantage of this deal in-store only via their Cartwheel app through Saturday, October 22nd.